I spent 2nd March 2017, World Book Day, with the wonderful staff and students of Bishop’s Stortford Prep School. 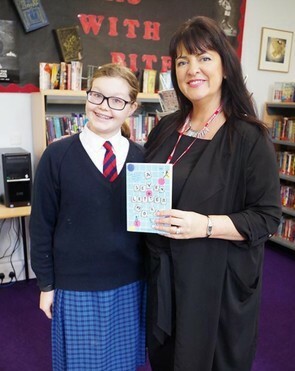 The school’s librarian, Rosie Pike, had booked the visit with me many months ago and I’d been particularly looking forward to visiting, as the school is the home of my current ‘Star Reader’ Hannah, who, during last year’s summer term, read ‘A Seven-Letter Word’ in record time and sent me a wonderful letter together with some photographs. Mrs Pike told me that Hannah had been a tremendous help in publicising my forthcoming visit, willingly giving her own time to act as ambassador to spread the word amongst her fellow students! I arrived in the lovely village of Mountfitchet the evening before and was able to meet a few members of staff, including Mrs Pike, the Head of English and Hannah’s lovely mum, Jane. I started World Book Day with an early workshop where we explored the use of LS Lowry’s artwork in ‘Smart.’ We had a surprise visitor during the session – an OFSTED inspector! Were we fazed? Not at all! We carried on regardless and needless to say, the students were totally brilliant and full of ideas and comments about our theme. There were more workshops throughout the day, all taking place in the library. We covered subjects such as bullying, feeling different and writing good characters. I also spoke about Nottinghamshire, the setting for my books and the place that Mrs Pike herself hails from! 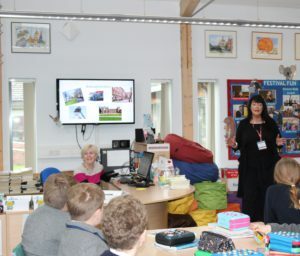 Mrs Pike works tirelessly to encourage young readers and runs all sorts of exciting clubs and events, including the recent and very successful, Festival of Literature, which welcomed some very well-known authors to the local community. I was very pleased to meet Hannah, my ‘star reader’, in person (see main photo). She had lots of questions and comments and was a true credit to the school, as indeed were all of the students I met on the day. It is rare to see such enthusiasm for reading coupled with a burning curiosity that bred lots of interesting questions and such excellent behaviour all day long. I found all students to be so wonderfully engaged in all the sessions and I very much look forward to visiting Mrs Pike’s library again at some point! You can read more about the day on the school’s website, here.